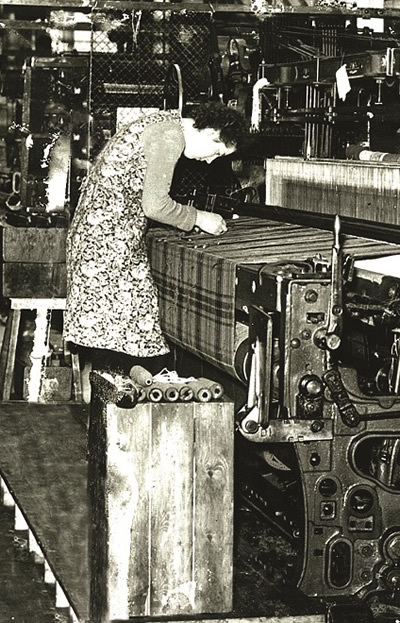 The woollen industry in Hawick dates from the 18th Century, with the manufacture of stockings. There will have been hand knitting before then but the specific date of 1771 is normally given for the foundation of the industry, to mark the introduction of stocking frames to the town by Bailie John Hardie, a merchant who had found them in use in the west of Scotland. To begin with, these would be used by out-workers in their own homes but increasingly water-power and steam-power saw machinery concentrated alongside the rivers. Rail transport came to the town in 1849 with the arrival of the line from the Lothian coalfield and significantly the onward connection from Hawick to Carlisle, completing the Waverley Line, was not made until later, in 1862. The Pringles had founded their enterprise in 1815, and other manufacturers steadily followed: Barrie, Innes Henderson, Lyle & Scott, Peter Scott, Robert Noble, for example, on the knitwear side, and Blenkhorn Richardson, Wilson & Glenny for example, making worsted cloth. Those examples all bear individual family names reflecting pride in the quality of the product, and there came to be many other family businesses as well as others with more neutral names such as Braemar during a long period until the end of the 20th Century. Stockings ‘grew’ into combination underwear, and then into outerwear: pullovers, cardigans, and the famous twin-set. With the growth of the industry came an influx of workers and Hawick’s population peaked at 19800 in 1891, when it is worth remembering the area of the town was a fraction of its present spread, with none of the post-WW2 housing estates and with rampant overcrowding in tenement homes. The mill-owners’ own large houses were predominantly in the west of the town, for example on the well-titled Sunnyhill area, where there was less chance of a prevailing south-westerly wind bringing smoke and grime from domestic or factory chimneys. Competition from cheaper manufacturing in the English Midlands and in Asia led to a period of decline, but now, once again, in the 21st Century, Hawick’s knitwear industry is thriving, based on design and on quality. Leading producers today include Barrie (Chanel), Hawick Cashmere, Hawick Knitwear, House of Cheviot, Johnston of Elgin, Peter Scott, Scott & Charters, Shorts of Hawick, and William Lockie. Several of these producers have mill shops, visitor centres perhaps with a restaurant, and regular mill sales. Car parking is no problem at all. You’ll also be able to find out much more about the local industry at the Borders Textile Towerhouse, housed, near where we began our historical account, in Drumlanrig’s Tower.